I Hope You Win This Get Away! If you are stopping by today from my devotion, The Best Laid Plans, with Proverbs 31 Ministries welcome! I am so glad you’re here! Today is a very special day because it marks the beginning of a month of celebrating my new release, Magnetic: Becoming the Girl He Wants! Over the next few weeks, we’ll be celebrating in all kinds of ways! Also over the next month, I’m giving away one BIG giveaway every single week, along with a grand prize giveaway that runs the entire four weeks! You’ll want to enter to win each and every one of them (and tell your friends to enter too!)! Let’s head to the celebration and the place for you to sign up! Click here for the give away page! 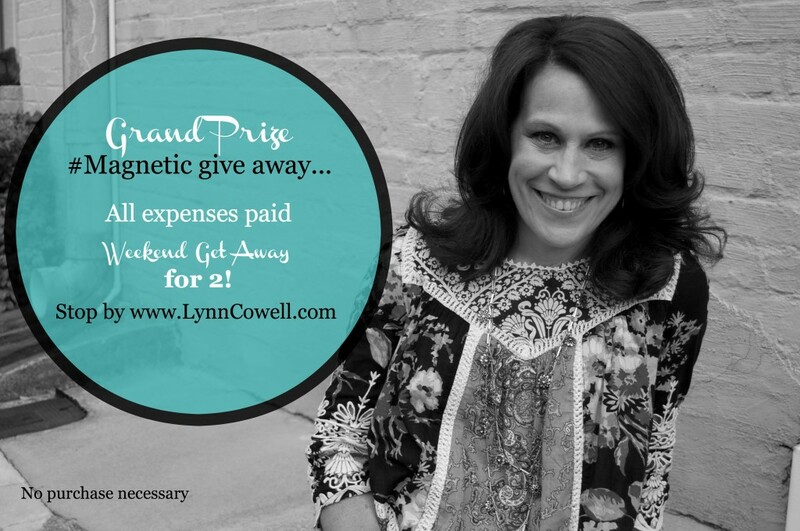 If you are getting this via email, you must enter the give away by going to www.LynnCowell.com. Also, don’t miss: 9 Scriptures to Pray Over Your Girl; a must-have resource to help you pray God’s Word for your girl! Charge up your prayer life with Scriptures and claim the power of God’s promises for protection, confidence and encouragement over the girl you love! Download your FREE copy here. All the planning I worried and fretted over ( you notice there was no prayer in my plans). Not one of my children chose my plan for them. All stumbled and failed tried again and 1 or 2 were drowning in there choices, God in graciousness picked up the broken pieces reshaped them and used the brokenness to Glorify His kingdom. As adults they have good jobs, and have blessed me with 12 beautiful grandchildren. And I learned the most important thing I can do for my grandchildren is to pray for God to guide them as He desires more for them than I can even imagine. Thank you Abba Father. Thank you for sharing your story and your wisdom, Linda! Lynn, I am so excited for you. I know this book is going to be amazing and just what so many of our girls, and even is need! Love you! I am so excited to share Lynn’s new book and READ it for myself!! A great message and so relevant to learning what makes a girl MAGNETIC! Thank you so much, Julie! And thanks to your family for providing some great content! I just wanted to let you know that your devotional yesterday on Proverbs 31 was an answer to prayer for me. I sat down with my coffee, Bible, iPad, and tissues as I was weeping over whether we made the correct school choice for our Kindergartener. I had wanted a private Christian school that we just couldn’t afford and had prayed ceaselessly last year that the Lord would open the door for a way into that school, IF that was where our daughter belonged. No door opened. School started last week and has already been unsettling for our family. I was in emotional turmoil yesterday morning about it, questioning why, why didn’t we just enroll her where I wanted her to be. I settled in and read your devotional and it was as if the good Lord himself was having coffee with me and explaining, “You asked; I said no. I know better than you do. Give it up, sister! Let it go and trust I know what I’m doing for your daughter’s life.” My tears of desperation turned to tears of relief and contriteness. Your devotional was perfectly timed in my life and I am grateful to you for allowing yourself to be used by God to touch the lives of others. Thanks for your beautiful writing and being a little bit of balm to this anxious Mom’s heart. Have a great Thursday! Misty, thank you so very much for sharing this! Last night, my mama heart was trying to go from stirring to sweating and Jesus reminded me of my own devotion. He truly does know what is best for our kids. He loves them more than we do and we can trust Him!